Reinventing Ruby Out in Print! 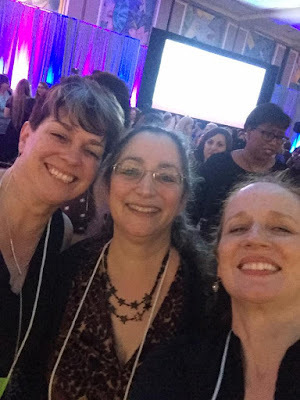 I've been back from my trip to the RWA National Conference for a week and a half, but it has taken me this long to get around to reporting on it because A) as usual, I was exhausted when I came back and B) I've been really busy. But here, at last, is a quick report on my trip. Oh, sorry, you wanted a little more detail? I got in Wednesday late morning, checked in, and caught up with my roommate, the fabulous Maria V. Snyder. (I adore her books. If you haven't read them yet, go run out and catch up.) The two of us ended up going out to dinner that first night with two of my favorite peeps from the Coastal Magic convention, author extraordinaire Carrie Ann Ryan and copy editor extraordinaire and Official Woman with the Coolest Hair Chelle Olson. We went to a fun brewery restaurant and shared tastes of all the different beers made in house. Also, yummy guacamole. Had breakfast and then other meet-ups with one of my favorite people, Harlequin senior editor Patience Bloom (who has the best red hair evah and is also a sweetie of the Nth order). At these cons, you tend to run into the same people over and over again. At this particular one, that person was the lovely and charming Susan Elizabeth Phillips. I kept swearing I wasn't stalking her, but I'm not sure she believed me. Either way, she was absolutely gracious about it. Susan Elizabeth Phillips. And yes, that book came home with me. At the "Cool Kids" table for the awards ceremony. One of the highlights of the convention is the RITA awards ceremony. I actually got to sit at the Cool Kids table between amazing author Kristan Higgins and my lovely pal Patience. The last night, I had fun in a photo booth with Princess Alethea Kontis (who I also know from Coastal Magic--seriously, you people want to go to THAT convention) at Sherrilyn Kenyon's book release party. It is possible we got a little silly. 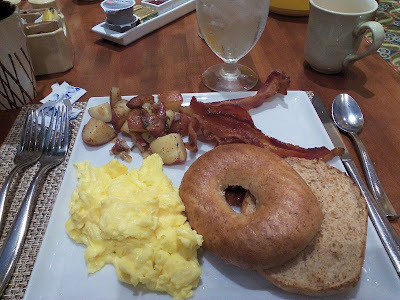 As always, I kept my goal to have bacon every day at the con. It's important to have goals in life, don't you think? Dinner on the last night with roomie Maria. BBQ by the pool, yum! I always come home from these things with a million books. This time I swore I would limit it to ten, so I didn't have to pay to ship a big box home. Yeah. Not so much. 27 is the same as 10, right? Although in my defense, the three books in the middle are ones my agent brought me to read for inspiration on the current book I'm writing, and the pile on the right is for the cat sitters and some friends, and a giveaway. AND I had to mail home the rest of the swag I brought with me to give away. Oh, wait, did I say giveaway? I brought home a copy of Susan's last book, The Family Tree (I already have it in hardcover), plus a luggage tag with a picture of her upcoming book, A Map of the Heart. Plus, there are two tote bags! I'll probably also throw in some misc. bookmarks and such. Who wants to enter? This is going to be a quickie giveaway, only on for a few days, so be sure to enter right away. Oh, and Magic the Cat would like you to know that she helped me pack. She's never happy about me leaving, and you can tell. Next up, a blog about my visit to Animal Adventure Park to see April the giraffe! I think I met Julie at one of the RWA Nationals in NYC years ago, but only briefly. 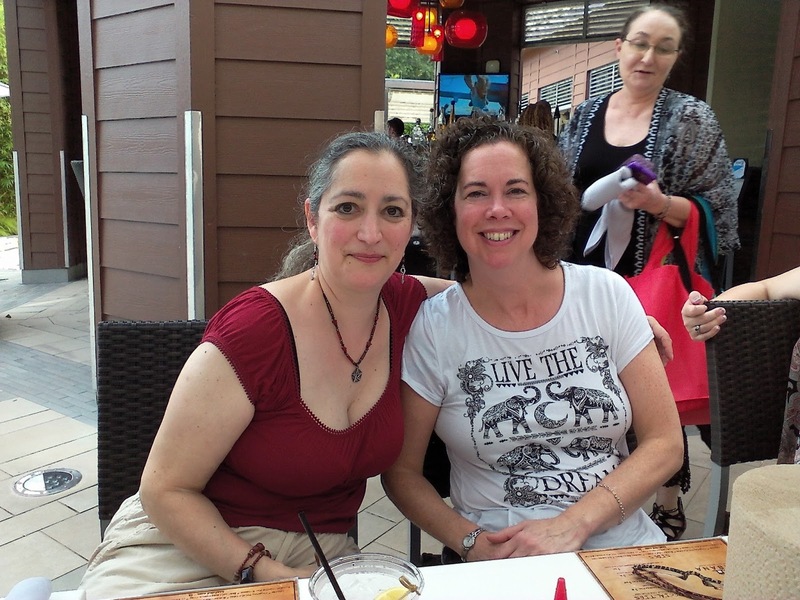 I've met Nora a few times at RWA. She's very nice. I would like to meet Karen White. I love her Tradd Street series. I would love to meet Mary Oliver. Oh that book is on my wish list! I would love to meet you of course, Alex Bledsoe and Stephen King! Nora Roberts, first choice, but then it would have to be you, Tawna, and all the other betty authors.